Portuguese laurel is a native of several western Mediterranean countries, although rather rare in the wild and is typical of many Mediterranean plants with its thick, leathery, evergreen leaves. 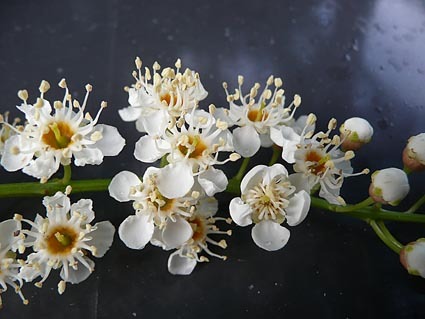 As Prunus, it is allied to cherries, plums, almonds and blackthorn. This species should not be confused with cherry laurel (Prunus laurocerasus) or indeed bay tree (Laurus nobilis) whose leaf shape is somewhat similar. Bay leaf has a distinctive pleasant aromatic smell while Portuguese laurel leaf contains cyanide and is poisonous, something to bear in mind. The flowers of Portuguese laurel are small and starry and fragrant and borne in slender but showy racemes in June/July.The fruit, produced rather sparingly in this country, start reddish and turn black. 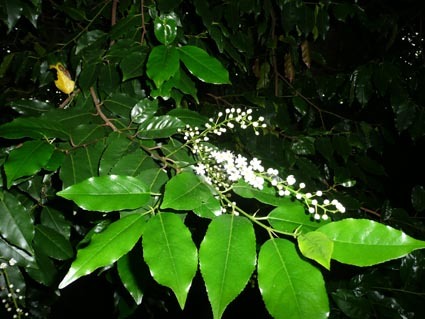 While probably not poisonous, consuming the fruit is not recommended as the similar-looking berries of the cherry laurel (Prunus laurocerasus) are poisonous. 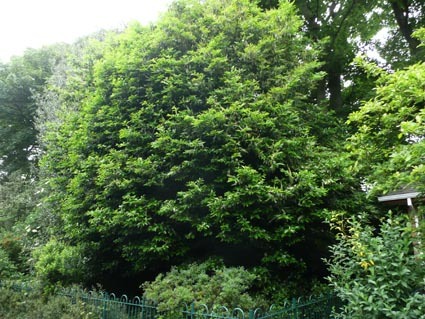 Portuguese laurel can form a handsome specimen tree to 4-5m and is a valuable garden plant that is amenable to hedging and topiary and is often used where bay cannot grow. It is tolerant of shallow, chalky, soils. It was first introduced to the UK in 1648 and received an award of garden merit in 1984. The specimen in Belfast Botanic Gardens can be found beside the path that leads from Botanic Avenue towards Botanic Primary School.